The incredibly supportive and extremely talented Elizabeth from The Notepasser was kind enough to kick off this new theme which focuses transforming our kitchens to a greener, waste free, inviting environment. Be sure to check out Elizabeth's Blog HERE, her articles are incredibly inspiring and informative and she creates amazing illustrations to match. Below are her recommendations which are nothing short of spectacular. Ready for a way of life that is challenging, but ultimately cleaner, healthier, cheaper, and better for the environment? Going zero waste in your kitchen—that is, no waste going to the landfill—isn’t impossible, but reducing waste is as much about organization as it is about dedication. I’ll offer two scenarios as examples. In the first scenario, imagine you buy microwavable popcorn, which is housed in a paper bag laminated with a metalized film, inside a plastic bag, inside a box. In the second scenario, you buy popcorn kernels from a bulk bin and pop it with oil in a big pot on the stove, resulting in a zero waste crunchy snack. 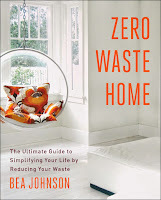 This is an example of the kind of thinking necessary to start moving to a zero waste lifestyle. Allow me to provide you with some basic guidelines to help you greatly reduce your kitchen waste. Bulk bins are your friend. You’ll be amazed at what you can find to buy in bulk: nut butters, honey, olive oil, soap. Look for bins in health food stores, local co-ops, and Whole Foods. The lone mobile app pointing consumers to unpackaged goods has, unfortunately, hit a funding wall and is in need of help. Keep it going by donating on Indiegogo here. When you go to the store, always take reusable shopping bags and reusable produce bags. Net or mesh ones are great for produce and cloth ones work like a charm for grains, flours, nuts, and dried fruit. I like to keep a tote with a couple of produce bags in my purse in case I make an unplanned stop at the grocery store. Beyond the bulk bins, choose produce that is loose rather than packaged. This usually ends up being cheaper, as you pay a premium for pre-cut or pre-packaged foods. It’s healthier too, because it leads to buying whole foods over processed ones. You might consider joining a local CSA or shopping regularly at your farmer’s market (with your reusable bags in tow, of course). 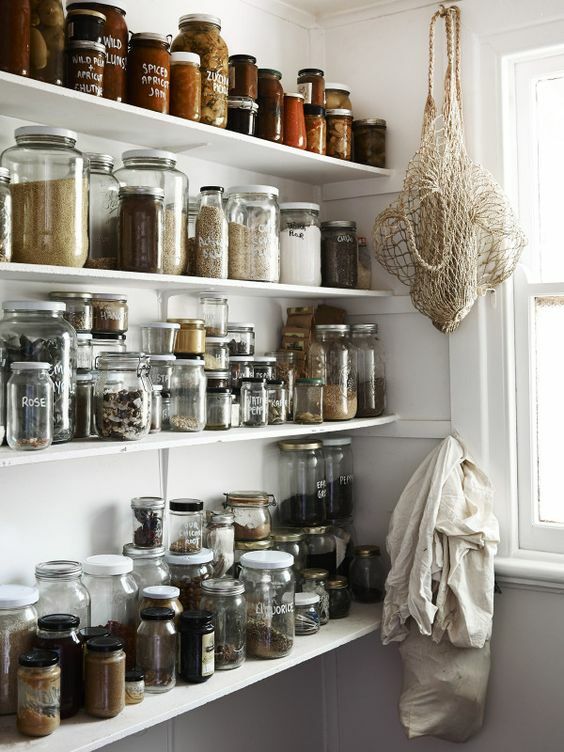 When you can’t find something in bulk, choose a glass container over a plastic one because glass is infinitely recyclable—and it will help you collect jars for your own food storage in the process. When you get home, store your goods in containers like ceramic canisters or those collected glass jars. Buying groceries throughout the week instead of all at once and storing fresh produce properly will help reduce unnecessary food waste. 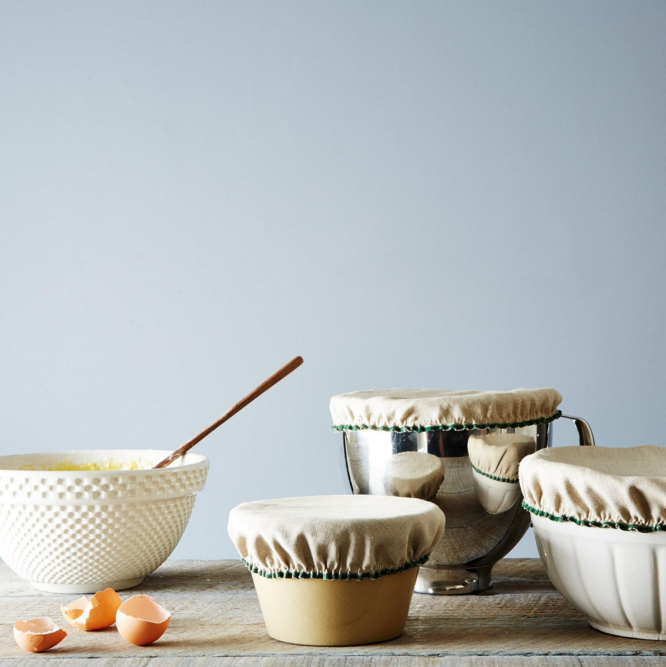 Leftovers can simply be stored in bowls with plates on top, in jars, or with the help of reusable wraps like these from Abeego (vegan options here and here). In fact, your whole coffee routine can be made zero waste. Whatever organic waste you don’t reuse in the kitchen can be composted. This may require some research on your part, but there is likely a way to get involved with composting in your area. I keep my scraps in plastic bags in the freezer and drop them off once a week at a farmer’s market. Your city may do pick ups or have collection locations (like they do here in NYC). If you have a backyard, start your own compost heap or worm bin. You can even use a worm bin in an apartment or try out a bokashi composting system. In addition to food waste, there are many other organic materials that are compostable. I created this flowchart to help sort out what can be composted. Feel free to download it, print it, and keep it on your fridge for reference. I have found that I really only need three ingredients to clean everything: vinegar, baking soda, and castile soap. If I could find these things in bulk, I would be all set. As it is, I have only found the castile soap, but vinegar can be found in glass bottles and baking soda comes in cardboard. Pro tip: spray bottle tops fit on vinegar bottles, so I reuse them anyway. Vinegar alone cleans glass, cuts grease, and generally shines. Baking soda scrubs food off dishes and deodorizes. Castile soap plus baking soda cuts through oily messes. 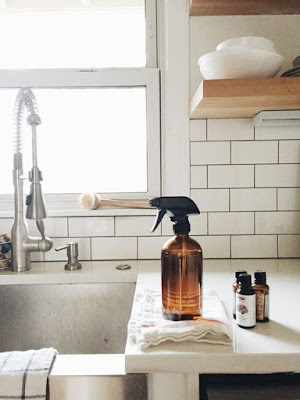 Castile soap alone gently cleans anything and can even be used as dish soap. Use rags or cut up old t-shirts to clean. Stock up on natural scrubbers made from cotton or corn cobs. Paper towel use can be eliminated or cut down (compost any you do use) when rags or People Towels are made closer at hand. Don’t be discouraged if you can’t do everything at once. Even if you don’t make all of these changes now, once you start reducing your kitchen waste you’ll be encouraged to continue the challenge until finally...zero. Make it a household goal with a reward at the end and you’ll be a healthier, wealthier community for it. Elizabeth's Blog, The Notepasser has a bounty of beautiful posts, you'll find her inspiring rhetoric and clever creations HERE. She's running a giveaway with some gorgeous zero waste goods from Whistlethorn HERE too if you wanna get started on that sweet sustainability! The mobile app Elizabeth mentioned above, the one which helps consumers find stores which sell unpackaged goods (and is in need of funding!) 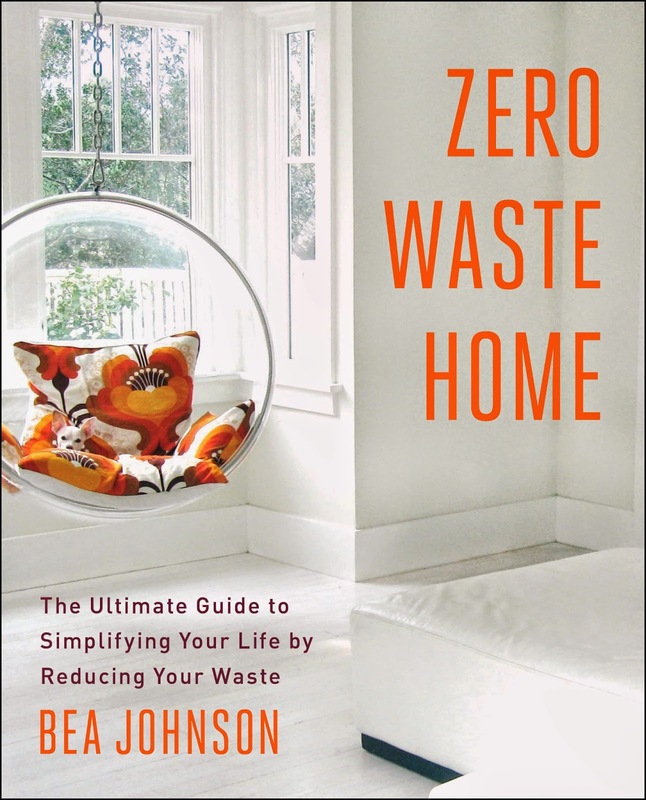 is by Bea author of the Zero Waste Home, you can donate to the app HERE, or support her by buying her book HERE. 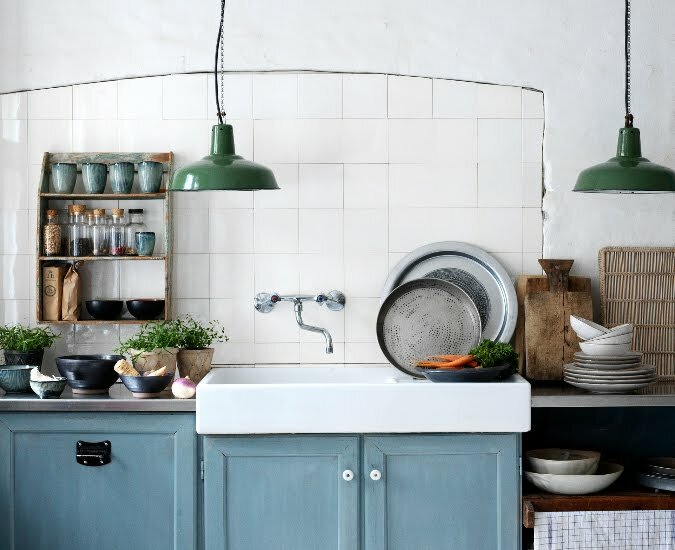 I'm trying to find a shallow apron farmhouse sink and I love the one pictured in the image above. Is that your kitchen? Trying to find where that sink is from. Hey Christina - unfortunately, that's a photo from Pinterest (photo 1 above) not my own sink - but I've seen some at home depot and some vintage ones at Maison Emperuer her in France (see my most recent post for a link!) hope you're having a lovely day!